DEADLINE EXTENDED TO FEBRUARY 15, 2014!!! Do you have a relationship with the south shore of Last Mountain Lake? 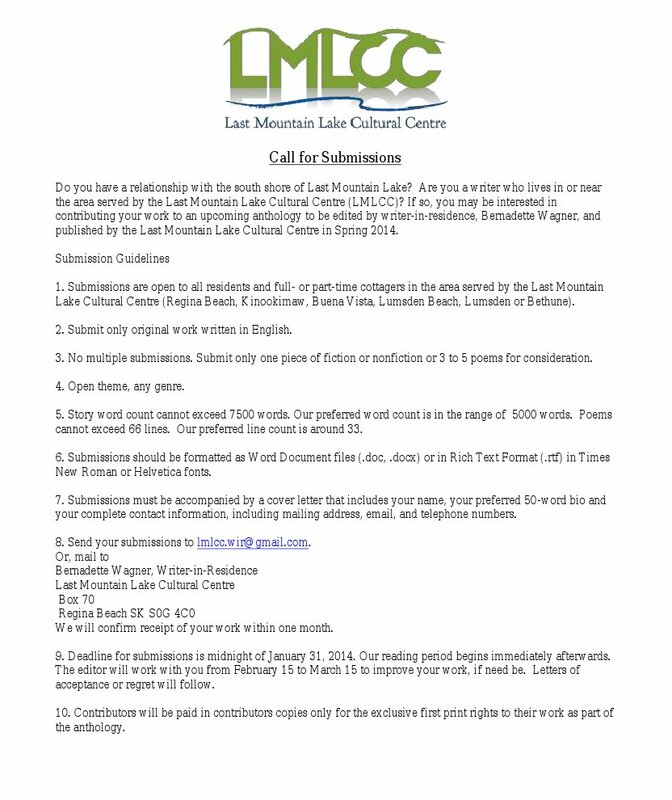 Are you a writer who lives in or near the area served by the Last Mountain Lake Cultural Centre (LMLCC)? If so, you may be interested in contributing your work to an upcoming anthology to be edited by writer-in-residence, Bernadette Wagner, and published by the Last Mountain Lake Cultural Centre in Spring 2014. 1. Submissions are open to all residents and full- or part-time cottagers in the area served by the Last Mountain Lake Cultural Centre (Regina Beach, Kinookimaw, Buena Vista, Lumsden Beach, Lumsden or Bethune). 2. Submit only original work written in English. 3. No multiple submissions. Submit only one piece of fiction or nonfiction or 3 to 5 poems for consideration. 4. Open theme, any genre. 5. Prose word count cannot exceed 7500 words. Our preferred word count is in the range of 5000 words. Poems cannot exceed 66 lines. Our preferred line count is around 33. 6. Submissions should be formatted as Word Document files (.doc, .docx) or in Rich Text Format (.rtf) in Times New Roman or Helvetica fonts. 7. Submissions must be accompanied by a cover letter that includes your name, your preferred 50-word bio and your complete contact information, including mailing address, email, and telephone numbers. We will confirm receipt of your work within one month. 9. Deadline for submissions is midnight of FEBRUARY 15, 2014. Our reading period begins immediately afterwards. The editor will work with you from February 15 to March 15 to improve your work, if need be. Letters of acceptance or regret will follow. 10. Contributors will be paid in contributors copies only for the exclusive first print rights to their work as part of the anthology. Call for Submissions in PDF. Well, you could always submit. It’s much too early to tell whether or not we’ll accept it. 🙂 There are many variables. Residency is but one.